I'm a big fan of 16-bit RPGs--especially those that appeared on Nintendo's Super Nintendo Entertainment System/Super Famicom. 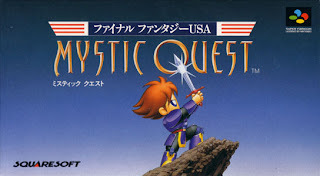 Among my favorites is one of those games that almost everyone (else) loves to hate, Final Fantasy: Mystic Quest. The folks over at OriginalSoundVersion.com have posted an extremely interesting interview with that title's composer, Ryuji Sasai. Sasai talks about many of the games he worked on while he was employed by what was then known as Squaresoft (now Square-Enix)--including Final Fantasy Legend III and Treasure of the Rudras--but most of his comments are aimed at the much maligned (and misunderstood) Final Fantasy spin-off. While talking about the track, “Mountain Range of Whirlwinds," for instance, Sasai says, that he included a french horn "because of its ability to really carry the length of the tune. My image of the mountains is represented by this song." Regarding two other tracks that are popular among fans of the title--“Last Castle” and “Battle 3"--Sasai says, "'Last Castle' was written in a relatively short period of time. Given all the music from the other scenes and the graphics and scenarios themselves, I figured I would go with something that would represent a finale of sorts but when I wrote it I utilized the imagery of a field instead. "I realized I would have only a small amount of space left in the ROM for writing 'Battle 3,'" he adds, "so within those conditions I did what I could. There wasn’t anything particularly difficult in writing these songs. I recall that they came off rather naturally." I've never heard of this game...which is odd, considering my love for all things SNES and RPG. Hrm...It looks great, actually! I might have to dig up a copy of this somewhere. Hey, thanks for linking to the article. It was hard to track Sasai-san down, and it was a great experience to be able to get some of my personal questions answered. Seems like a shy guy, but damn, he really remembered a lot of details about these older games! You're welcome, Jason! Really, though, thank *you* for posting the interview in the first place. I love reading interviews like this, especially when they have to do with games from the 8-bit and 16-bit eras. I found a copy of Mystic Quest for $14.95 at a thrift store in town I just discovered, so I bought it. I'm in the middle of Dragon Warrior 4 right now, though, so I've only played the first few minutes. It's different, to be sure, but I like it. Hey, that's great! I'm glad you like it so far - even though it's different. Let me know what you think of it after you give it some more time, wiil you?